Senate President Mike Miller speaks with reporters about the outcome of Tuesday's election. Hogan said his win shows that voters are tired of divisive, partisan politics. He blamed President Donald Trump for Republican losses in several county executive and state legislative races. “It was a repudiation of the president, who lost this state by 30 points,” he said. “People came out and expressed their frustration against just about all Republicans” — except for Hogan, who bested Ben Jealous by about 16 points. State Senate President Mike Miller blamed Jealous’s progressive policies for the loss. He said they are too liberal for Maryland. “If we’d had our county executive from Prince George’s County, Rushern Baker, the Democrat would have done a whole lot better. 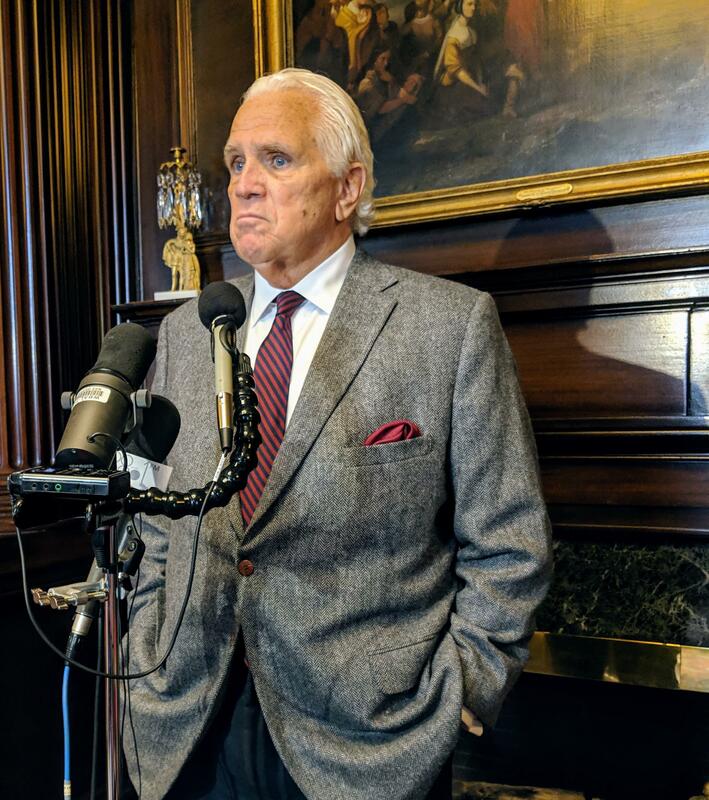 If we’d had the former chairman of the Board of Regents, who was that — Jim Shea, the Democrat would have done a whole lot better,” Miller said. Shea and Baker both lost to Jealous in the primary. WYPR reporter Rachel Baye gives Tom Hall a rundown of voting problems around Maryland, including issues with accessibility, polls that opened late, long waits, and power outages. Tom spoke with Rachel earlier this evening. Governor Larry Hogan easily won re-election Tuesday, the first Republican governor to do so since Theodore McKeldin in 1954. As the polls predicted, Hogan won a blow-out victory, besting Democrat Ben Jealous by 16 points. He took the stage at his victory party at the Westin Hotel in Annapolis in a room packed with more than a thousand family members, friends and supporters, jubilant that he had won again in a state with a two-to-one Democratic edge in voter registration. Maryland voters flocked to the polls Tuesday, despite the miserable weather, to cast ballots for governor, state representatives and a host of local officials. But in some ways, the election was as much about national politics as it was local races. They’re looking at two districts in Baltimore County, one in Frederick County and one on the lower Eastern Shore, where incumbent Senator Jim Mathias is locked in a tough race with first term Delegate Mary Beth Carozza.